Flap Discs: Product Spotlight - ARC Abrasives, Inc.
Flap discs are a 3D product that consists of abrasive flaps glued radially to a backing plate. While the product wears down, new abrasive is exposed. Zirconia is the most common grain for these discs due to the cool-cutting action and competitive price. These abrasive products are utilized through heavy stock and weld removal in the industry. While resin fiber discs can get the job done, a flap disc has an increased lifespan that surpasses the relative product. It is recommended to use a coarser flap disc in order to achieve a similar finish of a resin fiber disc. For instance, if an operator is using a resin fiber disc of 60 grit, try a 40 grit flap disc for a more agile performance. The backing plates come with either aluminum, fiberglass, or trimmable plastic. While fiberglass is the most common, aluminum is chosen more frequently due to ease of safety. Plastic backings are becoming more popular with some manufacturers, advising that the plastic can be trimmed to increase working life. A flap disc is broken down into a flat or angle face. 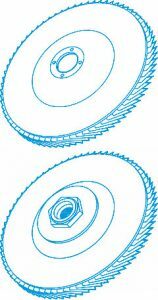 Following grinding terminology, flap discs are considered a type 27, while angle discs are known as a type 29. Angle faced discs are suited for stock removal due to their aggressive performance, and flat faced discs are more befitting on flat surfaces for a more consistent finish. A flap disc comes with a plain circular arbor that requires a locking nut, or a 5/8-11 threaded hub which allows for a quick changeover. The products are available as a regular or high density product. High density discs, often called jumbo discs, have more flaps and are more broad. While they may last longer due to the extra material, they tend to be less aggressive and are not recommended for heavy stock removal.